Jews spend endless hours of their lives in prayer, yet many Jews view prayer as an obligation to strike off the schedule rather than enjoy and be uplifted by. Since we generally don’t learn about prayer past grade school, we often find ourselves praying with the intellectual awareness of fifth graders – and we therefore find prayers to be meaningless and empty. 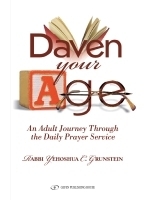 This book bridges that very gap – connecting the mind to the heart by allowing the laws of prayer, which people know so well, to influence the experience of praying in ways that have not yet been explored.